I am so excited to be teaching 2 farm fresh workshops at Farmstead on Saturday, August 21st. I'll be teaching Stamped Metal Art Quilt and also teaching A Year in Review Mini Album. Come learn metal stamping, using metal patina to age various metals, and combined with simple sewing techniques as we create this mixed media one-of-a-kind jewelry art piece. 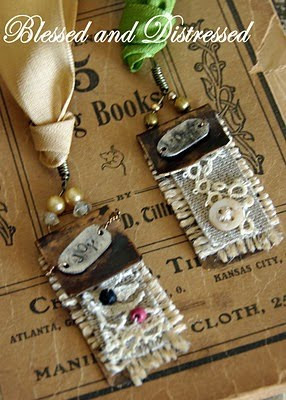 Workshop includes a wide array of vintage bits, wire, lace pieces and findings. No two pieces will be the same. 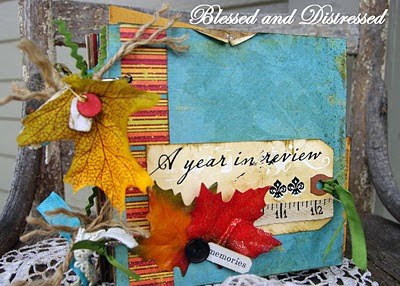 Create this beautiful Year in Review Mini Album. In this class we will be combining rich papers, lace, twill, seam binding, rub-ons and lots more as we create this perfect mini album to store your pictures. Filled with hidden places for special journaling. Students please bring adhesive, pop dots, scissors, wet and dry adhesive. Please call Kelly at 816-858-0120 or email Sheila at rumcraft@kc.rr.com to reserve your spot today. A minimum number for each class needed, so grab your girlfriends and sign up now! I still haven't posted about my fun day of jewelry making with you and now you're tempting me with another class!! Unfortunately I will be in MS that weekend dropping my son off for his first year of college so I will have to miss the August fun. Keep me posted about your plans for September.